McFarland, B. K.; Farrell, J. P.; Miyabe, S.; Tarantelli, F.; Aguilar, A.; Berrah, N.; Bostedt, C.; Bozek, J. D.; Bucksbaum, P. H.; Castagna, J. C.; Coffee, R. N.; Cryan, J. P.; Fang, L.; Feifel, R.; Gaffney, K. J.; Glownia, J. M.; Martinez, T. J.; Mucke, M.; Murphy, B.; Natan, A.; Osipov, T.; Petrović, V. S.; Schorb, S.; Schultz, T.; Spector, L. S.; Swiggers, M.; Tenney, I.; Wang, S.; White, J. L.; White, W.; Gühr, M. Nat Commun 2014, 5, doi:10.1038/ncomms5235. The deconvolution of nuclear and electronic ultrafast motions poses a great challenge for spectroscopic approaches and nonadiabatic dynamics simulations has been a valuable tool to help with this task. But are dynamics simulations providing reliable information? Take, for instance, thymine. The ultrafast dynamics of this molecule has been under debate for a decade. Thymine has the longest excited-state lifetime among the five canonical nucleobases in the gas phase. According to Ref. (1), after 267-nm excitation, thymine shows a double-exponential deactivation with 105-fs and 5.12-ps time constants. The long time constant, which has been assigned to the excited-state lifetime of thymine, was attributed at first to a trapping of the population in the S1 (nπ*) state after a quick relaxation from the initially excited S2 (ππ*) state (2) (see Fig. 1). As a second possibility, an independent study proposed that the deactivation occurred solely on the ππ* state, without any major influence of the nπ* state (3). In this case, the trapping site would be located at another region of the S1 surface at a minimum with ππ* character. Either way, from one of those S1 minima, thymine would take a few picoseconds to find the seam of conical intersections to the ground state, explaining its longer lifetime. Fig. 1 - After photoexcitation, how does thymine returns to the ground state? This interpretation has been disputed since different sets of dynamics simulations at CASSCF level predicted that the S2 (ππ*) → S1 (nπ*) relaxation time itself occurs on a few picoseconds (4,5). Hence both, elongated S2 (ππ*) → S1 (nπ*) relaxation and then S1 (nπ*) trapping, would contribute to the long time constant. 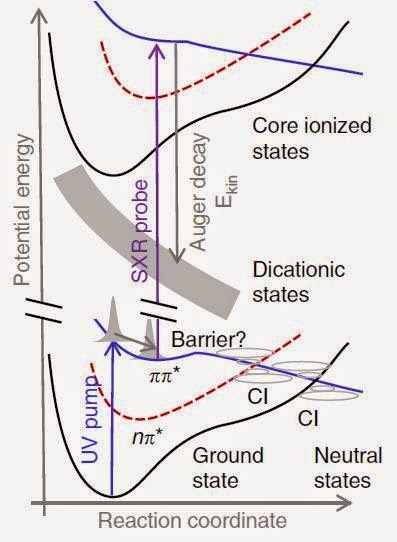 This entangled story has gained another chapter with a curious twist (6): based on ultrafast X-ray Auger probe spectroscopy and simulations (ADC(2), CK-CIS), McFarland and co-authors found strong evidences that thymine excitation at 266 nm should populate the S1 (nπ*) state within only 200 fs, just like in the first proposal. It makes possible that the S2 (ππ*) trapping was, after all, an artifact of dynamics simulations limited to CASSCF surfaces. (6) McFarland, B. K.; Farrell, J. P.; Miyabe, S.; Tarantelli, F.; Aguilar, A.; Berrah, N.; Bostedt, C.; Bozek, J. D.; Bucksbaum, P. H.; Castagna, J. C.; Coffee, R. N.; Cryan, J. P.; Fang, L.; Feifel, R.; Gaffney, K. J.; Glownia, J. M.; Martinez, T. J.; Mucke, M.; Murphy, B.; Natan, A.; Osipov, T.; Petrović, V. S.; Schorb, S.; Schultz, T.; Spector, L. S.; Swiggers, M.; Tenney, I.; Wang, S.; White, J. L.; White, W.; Gühr, M. Nat Commun 2014, 5, doi:10.1038/ncomms5235.